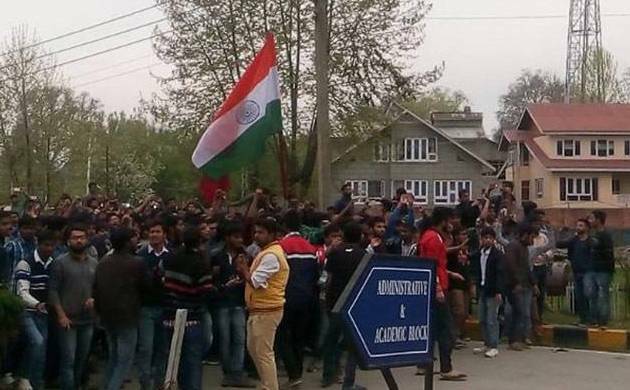 Situation at the National Institute of Technology (NIT) here continued to be tense today with a small group of outstation students staging a protest march within the campus, demanding shifting of the institute from Kashmir. The women students from other states, chanting “Bharat Mata Ki Jai” marched through the campus demanding shifting of NIT from Kashmir to outside the Valley, officials said. The protesting students marched through the campus even as state Director General of Police K Rajendra Kumar arrived at the institute to take stock of the situation. This is the third day of protests by outstation students who are demanding action against policemen involved in lathicharge on them. They have also accused some faculty members of alleged harassment of non-local students. The protesting students have said some of the staff members of NIT should resign so that “they do not play with any student’s career”. Faculty members, who spoke on condition of anonymity, said they were shocked at the allegations levelled against them. “The allegations are shocking. Just check the records and you will see outstation students have been doing better at examinations. If anything, we have been generous with them,” a faculty member said. He, however, said the faculty will not compromise on the standards of this prestigious institute. “We cannot pass even those who are mediocre in studies. The minimum standards have to be upheld,” he said. Yesterday, Union HRD ministry had sent a team of officials to assess the situation at NIT following the clashes which were triggered by India’s defeat at the hands of West Indies in the World Cup T20 last week. The students put several demands before the team including shifting of the NIT out of Kashmir, action against police personnel and faculty members, and construction of temple in the campus.